Now I'm trying not to focus this giveaway completely on the "i want followers" point of it... I genuinely love giving gifts and think that if someone has read and commented on my blog and took a general interest in what I'm talking about... well that's just lovely and who doesn't love a gift?? And even more exciting, who doesn't love surprises?!?! I just want to treat you guys! What will you get? You will get 2 things! 1. You will be able to choose a piece of jewelry from my friends etsy shop, Always Anchors. 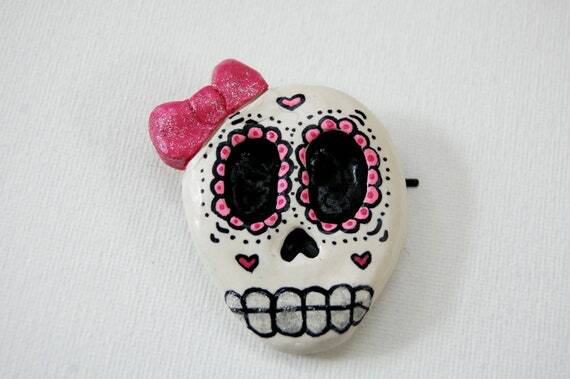 This is a cuteeee sugar skull hair pin from Always Anchors. Everything she makes is adorable and hand-made. After winning, I will contact you asking which piece you would like and pass your address on to her! So make sure you go and visit her shop and actually browse so you know what you would like! 2. Second prize will be a collective gift bag/box put together by me, especially for you! I will be including my all-time favourite product from last and this month, Pure BB cream (review here) as well as many, many other products (approx. 10+ products). This will be a collective gift bag and I will be looking at your blog to see what you like and checking out your recent reviews, wish lists, etc., so I'm going to be putting a lot of time into this because I think you should be rewarded for the time you put into entering! I am really going to make an effort to make a gift bag/box filled with things you will like which is why I can't give examples! There will be a mix of nail polish, eyeshadows, stationery, accessories, jewelry, beauty products, skin care products and anything else I can think of! 2. It closes on the 18th november, a week from now! 3. You have to follow me on GFC (google friend chat!) and like Always Anchors on facebook to enter... however you can earn more entries by doing more exciting things! If you want to earn the "tweet about this giveaway" just tweet something like: i just entered giveaway @naomi_jadex5's giveaway over at her blog here!" and link it. or just make something up yourself... i'm sure it's not that difficult & you can probably spice it up better than i can! lol! The gift bag will be posted within a week of winning... BUT I will be going out to purchase prizes especially for the winner (as mentioned above), so it may take a little longer than usual to receive as ALL the prizes are not pre purchased. a Rafflecopter giveaway see my last blog post here! (4 and 5 because I have sensitive/acne-prone skin!) good luck with the giveaway & your adorable blog! yay! so happy you've entered! Thanks for the comment on my blog hun :) great giveaway! I have a giveaway on my blog running now you should check it out!. i prefer bath and body product the most anyway! hi :) i'm a lovely 21 year old girl living in london. welcome to my blog where i'll be talking about everything i love from make up bargains, fashion, travelling, cute things and anything on my mind! let's be friends! i answer within 48 hours and i love a bit of chit chat! HAUL and 10 products for £10 challenge!